Pilgrimage to the Shrine of “El Cajas” (Ecuador), from October 31st to November 3rd, 2013. On Thursday, October 31st, a bus and a van left Chone with 9 sisters and 40 girls from Chone and Playa Prieta. In Jipijapa we picked up two more girls and a third in Guayaquil. 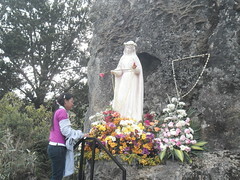 Our goal was to put ourselves at the feet of Our Lady “Guardian of the Faith,” advocation under which the Blessed Virgin Mary appeared to a young 16 year-old girl in Cuenca, Ecuador, between 1988-1990. Everything was prepared when, the night before the departure, the bus driver demanded 300 dollars more than we had agreed upon. Thanks to God we were able to find another bus available for the pilgrimage. Once we'd overcome the indignation and the shock, we headed out, but when were arriving at Pedro Carbo, a town close to Guayaquil, the bus suffered a serious breakdown. After some time, the bus driver managed to find us another bus from there that would take us to Guayaquil, to the parish of Our Lady of Loreto, where the Servant Brothers and Sisters expected us for the celebration of the Eucharist. We arrived just in time, travelling along a road of obstacles due to the road work in the surrounding streets. The other bus arrived a few hours later with the broken part fixed. After mass, we were able to pray the rosary with songs, led by one of the sectors of the parish of Loreto. Meanwhile, a group of girls and sisters, who had already attended mass that morning, prepared spaghetti with eggs and tuna that we happily devoured despite our tiredness from the trip. That night we slept in the parish hall on mats, cardboard, or directly on the floor. The next day we began with the celebration of the Eucharist in the Chapel of “El Condor” that the community of Servant Sisters of Guayaquil attends. Afterwards we went to eat breakfast. It seemed like the enemy did not want us to reach Cuenca, since a new problem with the bus delayed the departure more than 3 hours. Father Felix gave us points of meditation and we were able to pray before the Blessed Sacrament exposed. Then the girls, in teams, took advantage of this time to clean everything up and prepare a name and song for the team. At last we left to go to Cuenca, and began to go up the mountain range. What beautiful landscapes! When we reached about 2000 meters high, the van began to heat up and we had to stop. The hose that brings the water to the radiator had a crack, and the water leaked out. We left the van parked at a restaraunt in the mountains and we all squished onto the bus. We reached an altitude of 4000 meters and then began the descent. Cuenca is at the altitude of 2500 meters. We arrived at the retreat house Holy Mary of the Oblates of the Heart of Mary around 9 p.m., about ten hours later than we expected. Despite all the inconveniences, the girls had a good attitude. We had to live it all trusting in the Providence of God. That night we were able to rest on matresses and with lots of blankets piled on... the nights in Cuenca are cold. After a good breakfast we started out for the city of Cuenca, and attended mass in the Cathedral, which is beautiful! For some of the girls it was the first time they had seen such a beautiful church. We were able to enter into the old cathedral, a Marian Shrine of Our Lady of Mt. Carmel, and enjoy some folklore dances in a square surrounded by stands with traditional, hand-made objects. The weather was wonderful; the whole week it had been raining but this day was sunny. We returned to the bus to go back towards the mountain range to reach the national park of El Cajas, where the Shrine of Our Lady, Guardian of the Faith, is found. The Blessed Virgin brought the visionary, Patricia, to her chosen garden, 3500 meters high, in the sector of El Cajas, at 27.5 km of Cuenca. The bishop later gave permission to build a shrine there. The first thing we did was visit Our Blessed Mother. For everyone this was a moving moment. 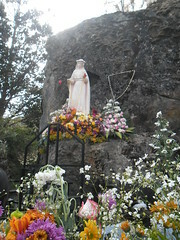 The image of Our Lady is found above a rock surrounded by a small garden enclosed by wooden benches. On the right side there is a crucifix on which an obviously wounded Christ is hung, and some fresh water fountains for the sick. We ate in the park and were reading some of the messages that Our Lady had given in this place. 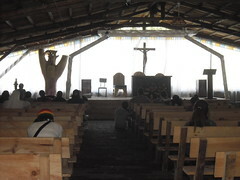 We returned to the Shrine, which is made of wood, very rustic, to visit Jesus in the Blessed Sacrament. From there we went again before Our Lady to pray the rosary and sing songs. We put ourselves at her feet, in the garden and sang songs to her with all our heart. It was hard for us to leave, since there we felt such great peace. Before supper, we had a meeting about faith, after a time of theater, songs and dance that the different teams put on. It was a day full of heart-warming experiences. The next day we cleaned up everything quickly to reach Cuenca in time for mass and return home. 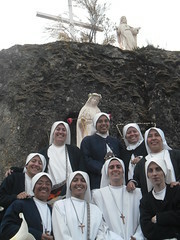 Passing through the mountain range at the altitude of the shrine we said good-by to Our Blessed Mother. We fixed the van and we began the journey home, which was more calm. We give thanks to God for this beautiful pilgrimage, and ask that Our Blessed Mother, Guardian of the Faith, may continue to keep us in her heart. 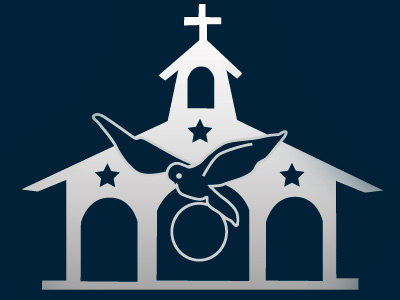 “Going to confession in Guayaquil helped me alot. It was the beginning of a new life that I was going to begin. It also helped me to open my heart more to God and to Our Blessed Mother. It was a very special grace. When we reached Cuenca, at the house where we were going to stay, I felt in my heart that I was at home and that the Blessed Virgin was there. Also, as the house was called the 'Heart of Mary', I felt that we are always in her heart and that She does not want us to ever leave it”.